- Bella+Canvas STYLES 3001 AND 3001CVC Unisex 4.2 Ounce Jersey Short Sleeve T-Shirt. 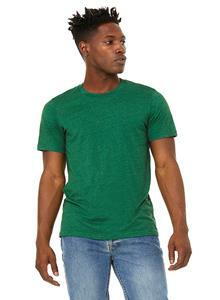 - Solid Colors: 100% Airlume Combed and Ringspun Cotton, 32 single 4.2 oz. - Ash made from 99% Airlume Combed and Ringspun Cotton, 1% polyester. - Athletic Heather & Black Heather made from 90% Airlume Combed and Ringspun Cotton, 10% polyester. - Heathers made from 52% Airlume Combed and Ringspun Cotton, 48% polyester.